You really won’t believe where germs can be festering! What are you missing during your big spring clean? Now that spring is nearly here (at last), many of us will be planning our cleaning regimes to get our homes looking fresh in time for the new season. But, given it’s often such a mammoth task to clean the house from top to bottom, it can be easy to overlook hidden areas. Spring cleaning is all about taking the time to spruce up neglected areas of the home, so you’ll want to make sure you’re not missing anywhere particularly grimy or unhygienic. We’ve shared three important spots that are often overlooked, so you can be sure to include them during your annual deep clean. Read on to find out more. We sit on our sofas and dining chairs every day, but most of us never stop to think about how dirty they can be. Even if you regularly hoover your sofa coverings, dust mites, pet hair, and dead skin can still build up in the fibres of your upholstery, and it takes more than just a quick hoover to get them properly clean. This spring, take the time to give your upholstered chairs and sofas a full shampoo. If you have washable sofa coverings, then these can be removed and washed according the manufacturer’s instructions. If you have a genuine leather sofa, then you’ll need to give it some extra TLC, as these can become cracked, stained and discoloured if they don’t receive the right care. Leather sofa specialists Sofas by Saxon have a complete guide to caring for leather sofas, including advice on cleaning and oiling natural leathers to ensure a soft, glossy finish. You’re probably already in the habit of giving your kitchen surfaces a wipe down at least once a day — and rightly so, as good hygiene is particularly important in the area where we prepare our meals. But, you probably don’t clean your kitchen cupboards and doors anywhere near as regularly, and bacteria, grease, and grime can build up on these surfaces, too. To get your whole kitchen sparkling clean, you’ll want to empty your cupboards and give the shelves a quick spritz and wipe down with an antibacterial spray and some warm soapy water. The exterior of cabinet doors near to ovens and hobs can be especially dirty, so you might need to use a kitchen cleaner that will cut through tough grease and grime. This way, you’ll have a much more hygienic place to store your food, and they’ll smell nicer, too. If you’re anything like us, then you couldn’t live without your trusty washing machine and dishwasher. But, to remain effective, these essential appliances still need a good deep clean every now and then to remove any internal build up. 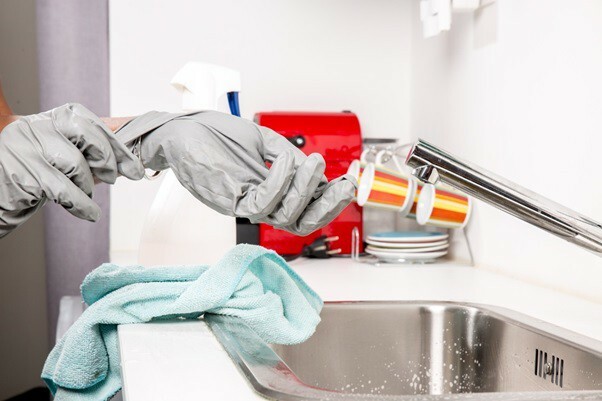 During daily use, dishwashers can get clogged up with food debris, limescale, and soap scum, all of which can have an impact on your machine’s ability to clean. To get stubborn dried-on food and stains off your dinner plates, your washer will need deep cleaning to remove this build up at least once a year. The spring cleaning season is the perfect time to do this, so take a look at this step by step guide to cleaning and descaling your dishwasher on Cleanipedia to find out how. Washing machines are also susceptible to build-ups of mould and unpleasant odours, and over time, this can make your laundry smell musty. So, you’ll want to give your machine a deep clean as part of your spring routine. Although you can buy specialist cleaning solutions, you can also make your own effective cleaning solution using vinegar and baking soda. To get rid of any lingering smells, simply add a cup of white vinegar to the drum, and two tablespoons of baking soda to the detergent drawer, and then run your machine on a long, hot cycle. Don’t forget to give the rim and inside of the door a quick wipe to remove any dirt, lint and stains that may have built up. Spring is the perfect time to get your home scrubbed up and looking it’s best, so be careful not to skip over these commonly overlooked areas when cleaning your home. This way, you’ll have a beautiful, clean and tidy home in time for the new season. Read more: How to do homework – for parents!